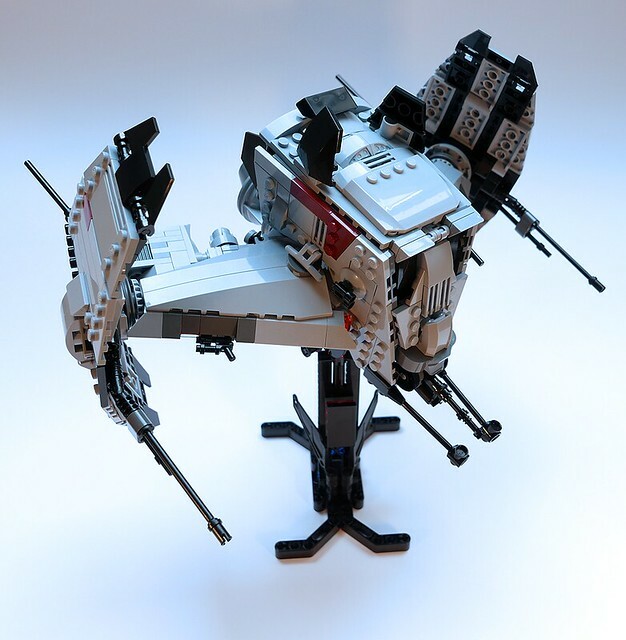 Started as an idea at the end of my AT-ST's thread, here's a WIP of a mashup in the same vein as the cool snowspeeder/AT-ST MOC (https://www.flickr.c...157626538023574), this one is an AT-ST, a Tie (Inquisitor's), and also the Batsign, hence the fitting name! I am fond of the initial smoothness, though I assume you are going to revisit to add a bunch of little details in some places? 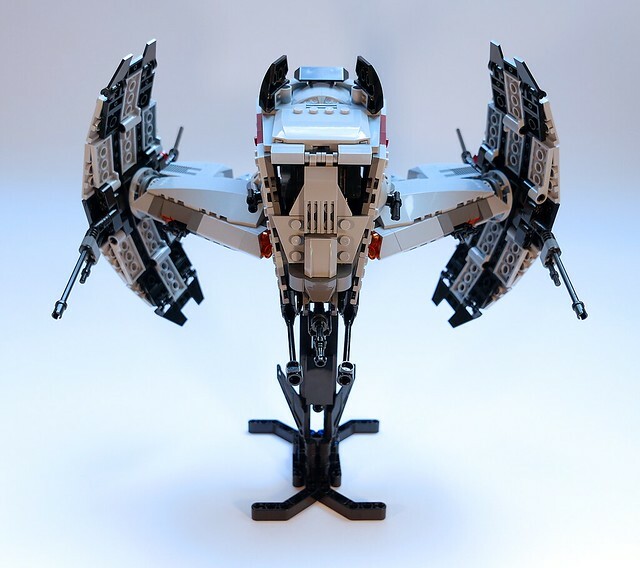 Love to see more views of this—the curvature of the wings appears intriguing! 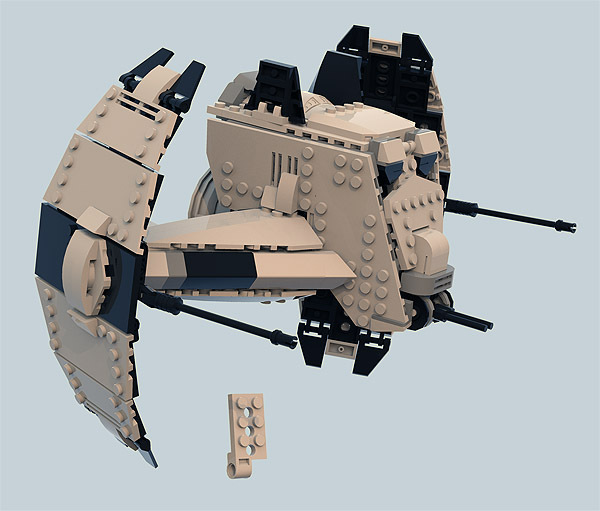 You've got some fantastic sculpting going on in this MOC! I really like the themes that you've mashed together. I love the entire thing - it looks totally badass. I like how the head looks nearly like the one on your AT-ST - but not quite. I especially like the wings. They actually LOOK like the wings on the Inquisitor's TIE, unlike the lumpen things on the official set. This is soo ugly... its actually really cute! It really works with the design too! As lilme said, Id love to see this from more angles, and with the more touches to it you intend to do. Hard to tell from the picture, but how did get such a curve for the wings? Of course, still a render, but 2 friction pins per segment should be enough. There are no stoppers so it'll probably be a pita to curve, but this also means that I'll be able to curve it any way I want (& also rotate the wings), and have fully flat ones. Head now has a bat-like nose and ears. 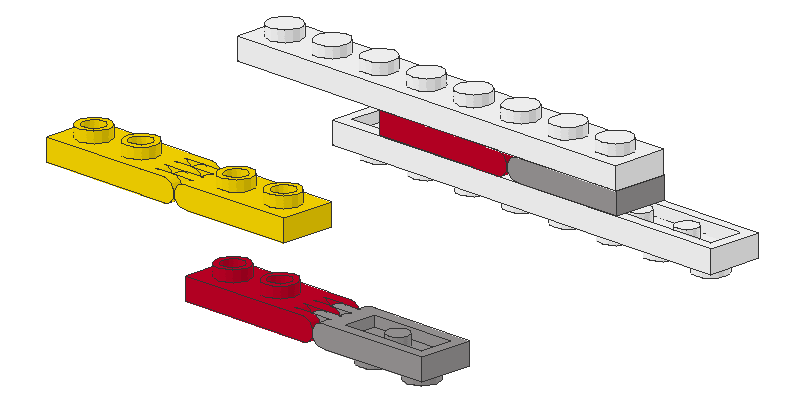 sure, I have broken a few when I was a kid, but all Lego had to do was to make them 1/3 large fingers, instead of 3/5. The fingers broke because they were too thin. 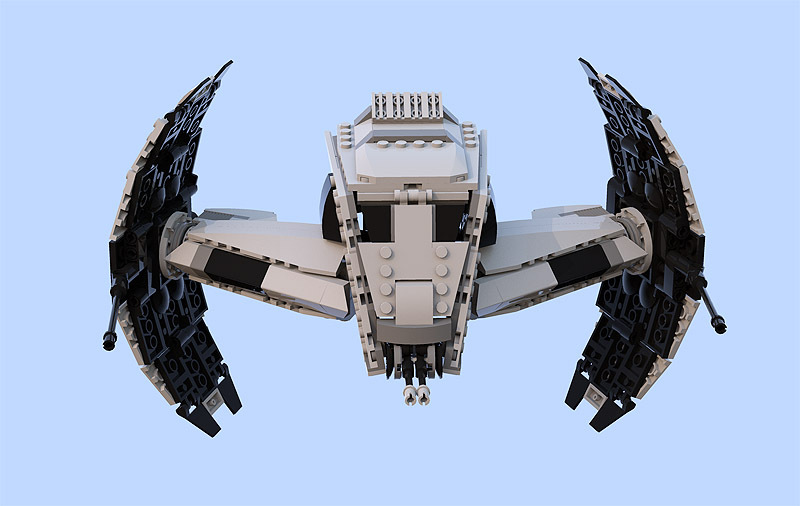 I couldn't find a proper Tie Inquisitor blueprint, but from what I see from a Hasbro toy, the wing's curve isn't symmetrical, and that would be quite hard to do in Lego, luckily I don't have to be accurate here. I'll have to find something else or the inner part of the wings will have to be grey. Here with grey plates, less batty, but still ok. But this also means that you can't use this trick to get 2-plates thick proper official Tie wings, as the interior should be all black. 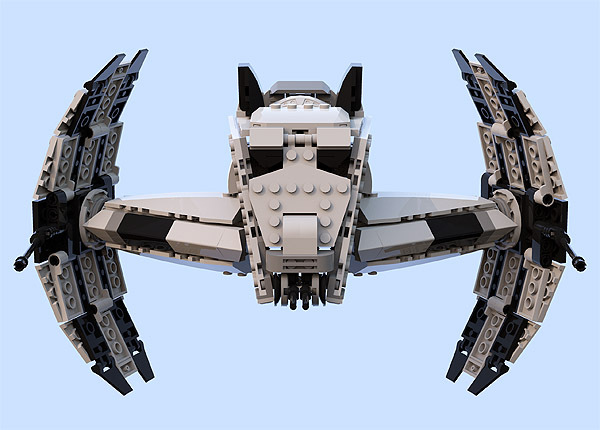 That looks well cool, hope someone adds the wings to their TIE Advanced. 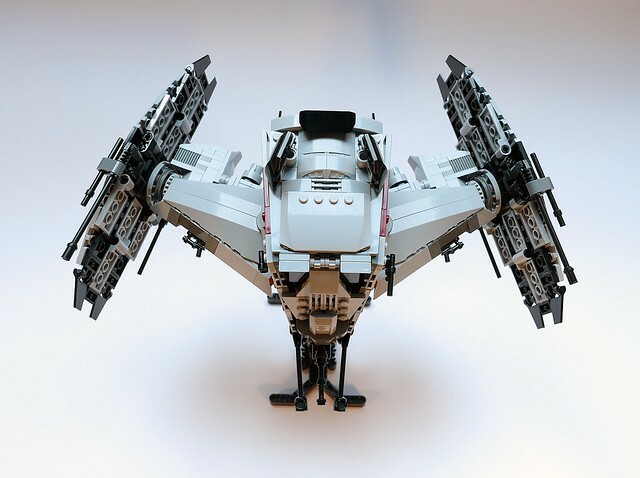 I honestly would prefer the light gray hinge plates—I think it highlights the handy use of these elements and portrays an interesting contrast in the color scheme (like the contrasting black panel in the middle of the wings. The ears are a nice touch too. I assume the practical function are as some kind of sensor array, comms array, or targeting systems? The AT-ST head really goes well in the middle and fits well with the wings. The hinging system works nicely as well. Wow! This is wicked! love the look of it! Great work! 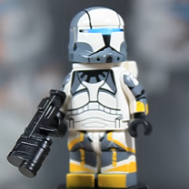 Nice MOC, but is it can able to fit in a minifigure in the cockpit? Looks really awesome, I like it a lot. You used there a lot of interesting special parts to manage the bending of the wings. The color scheme is also a big plus. The interior is pretty much the same as in my AT-ST, only with different consoles, and has the same problem that it can't be fully "seen". If I render it, there is no printed console, and if you open the thing to see it, you move the front hood which holds parts of the consoles, thus it simply can't be seen with the naked eye, other than by removing the side panels. ..which is why I investigated doing more interesting stuff inside, like having light bricks, but eventually I placed one on the display base (which is now done). Another idea was to control the rotation of the end wings (they rotate, I'll make a render) using a pull-back motor, but the wings are pretty busy inside for an axle through everything. I am fond of the red highlights and other touches you made to the back. I prefer the eyes above, but just with the trans-black panels, so the pilots can see and can be seen through the cockpit. Light bricks could be a nice touch, well, I am think of the red ones that is, so I don't know if you can somehow squish those in. Sadly I can't really fit the glass panels with the smaller eyes, they collide with the side panels a little (for this same reason, my AT-ST can't fully close its eyelids, btw). 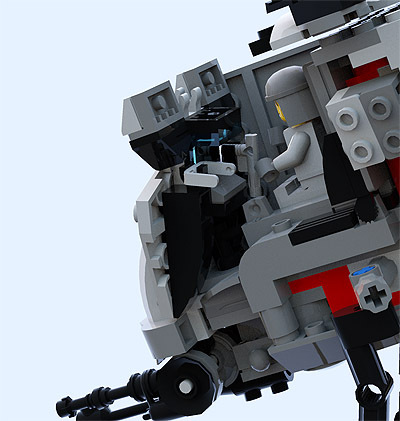 Also, minifigs can't be seen (in the AT-ST, thus it'll be the same deal here), it's all black, unless you look inside with a torchlight. 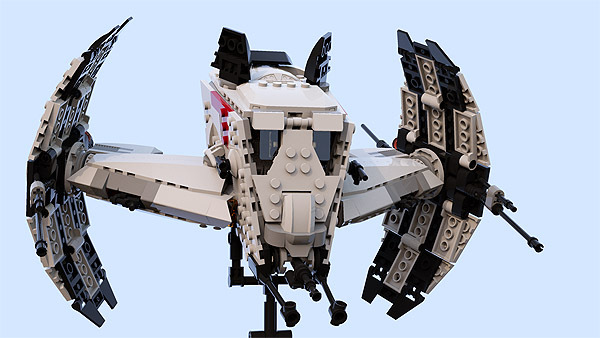 The only way to see the minifigs isinde would be a light brick, but I couldn't find a way to have one inside in an effective way, without taking one seat. Aw, oh well… It will still look impressive nevertheless. 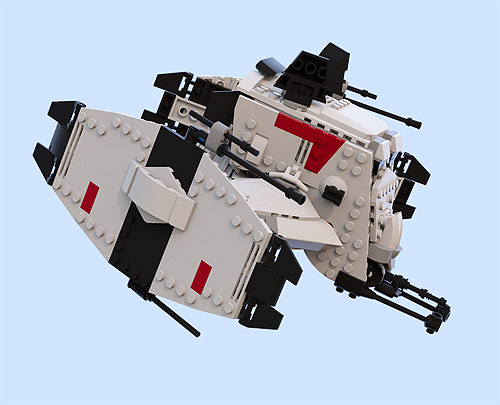 Though maybe you could somehow conceal the light brick below the cockpit and the light would be shooting up… Never mind it doesn't look like you could as compared to the image of the inside. BlueRender sounds like a useful tool. Being a Mac user, I read that is probably possible, though still have not figured it out yet. After too many weeks (mainly waiting for the parts - Belgian post had been on strike) & things going wrong, I'm now finished with it. I wish the interior of the wings was black, but maybe one day those parts will exist in black.